Severe Winter Storm Underway Across NM. Map Is Courtesy Of The Mildland NWS Office. 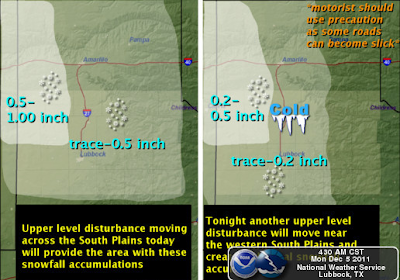 Maps Are Courtesy Of The Lubbock NWS Office. 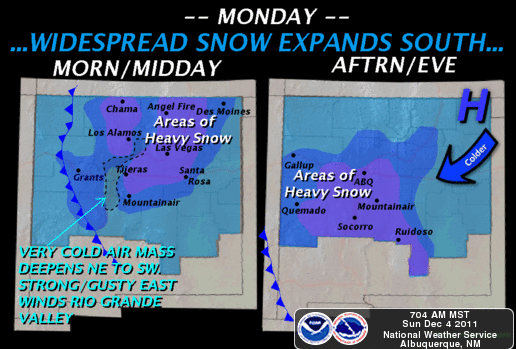 Maps Are Courtesy Of The Albuquerque NWS Office. Blog updated at 6:20 AM MST. Bitterly Cold Airmass To Grip NM Until Midweek. 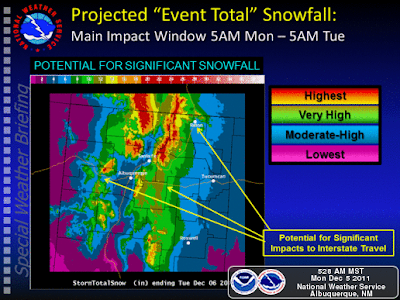 Potentially Life Threatening Winter Storm For NM! 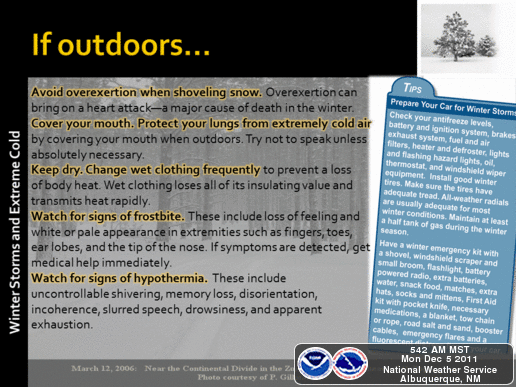 Latest Special Web Briefing From NWS El Paso. Good morning everyone. I will keep my web page updated today with all of the latest information concerning this very serious winter weather situation. 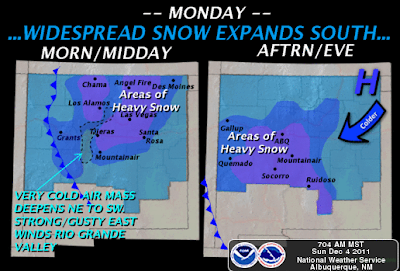 Our much anticipated Severe Winter Storm is underway across New Mexico early this morning. This winter storm is being called a "Potentially Life Threatening Storm" by some National Weather Service Forecasters. 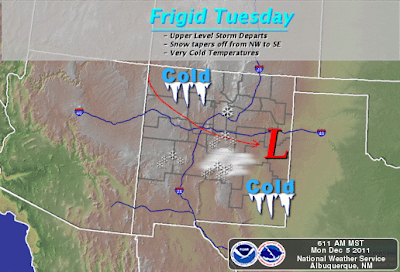 Early this morning a closed upper-level low was dropping slowly southward into the Four Corners Region. It is now forecast to drag itself ever so slowly across the state today through Wednesday morning. A Winter Weather Advisory continues in effect for the Guadalupe Mountains and Eddy County today through 5 AM MST Tuesday. 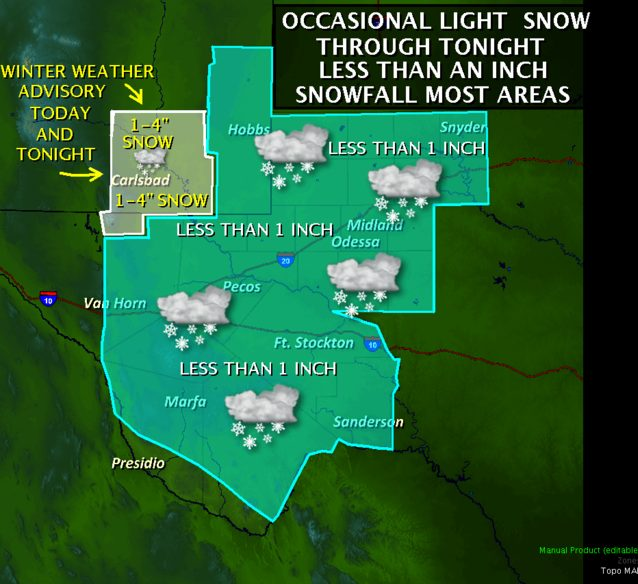 Snowfall totals in the Artesia and Carlsbad areas are now forecast to range from 2" - 4". Our high temperatures across SE NM today are forecast to hover at around freezing, with falling temperatures this afternoon. Forecast low temperatures tonight are in the teens to near 20. Our highs tomorrow will struggle to get out of the upper 20's. A Winter Storm Warning continues in effect for Chaves, Lincoln , Roosevelt, and Curry Counties until 11 AM MST Tuesday morning. 6" - 12" are forecast for Lincoln County, with higher totals across the higher peaks. The Chaves County plains are expecting 4" - 8" of new snow. 3" - 6" of new snow is forecast across Roosevelt an dCurry Counties. Northeast winds sustained at around 15-25 mph with gusts near 35 mph will create areas of blowing and drifting snow. A Winter Storm Warning continues in effect for Otero County until 11 PM MST Tuesday. This includes the Cloudcroft, High Rolls/Mountain Park, Wimsatt, Mayhill, Elk, Weed/Sacramento, Timberon/Pinon, and Sunspot areas. 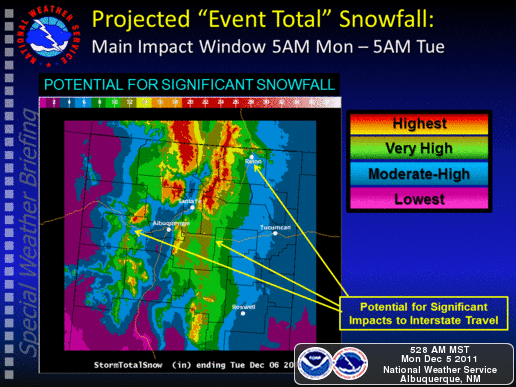 Snowfall totals of 12" - 15" are forecast above 7,500'. Snowfall totals of 7" - 12" are forecast below 7,500'. Northeast winds sustained at around 15-25 mph with gusts to 30-35 mph, combined with the heavy snow, blowing snow, and drifting snow, will create extremely dangerous travel conditions across the warnings areas of New Mexico today into tonight. Wind chill values will fall tonight as the re-enforcing surge of polar air heads south and southwest across the state. Wind chill values of -10F to 10F are anticipated. Our roads westbound (US Hwy's 70 & 82) and northbound (US Hwy's 70 and 285) out of the Pecos Valley, will become increasingly problematic today with time, as heavy snow falls across the Sacramento Mountains, and northward across the eastern plains into the Vaughn, Santa Rosa, and Clines Corners areas. Sections of I-40 and I-25 across the state will likely be shut down once again. Widespread travel problems are a real possibility for many areas of the state today into tonight, as mother unleashes her winter fury on the state. Road closures are going to be likely due to snow, heavy at times in some areas. Blowing and drifting snow, along with icy conditions will only add to the travel headaches across the state. For the latest road conditions across New Mexico please visit this link. When the snow finally stops, and our skies clear, we are going to see the coldest temperatures of the season. If fact we are more than likely going to see the coldest temperatures in the area since last February. But I don't think we are going to see four days in a row with readings as cold as what we had in February, but its going to get downright cold. Many of us are either at freezing or just below it this morning, and it will likely be Wednesday before we climb back up above the 32-degree mark. Forecast low temperatures across the northern New Mexico Mountain valley locations are in the minus teens to minus twenties range. 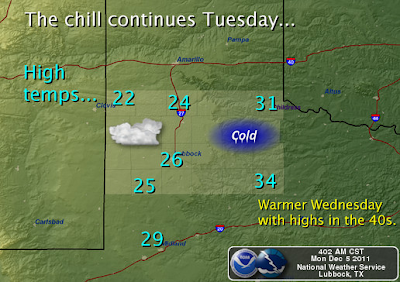 Forecast high temperatures will struggle to get out of the 20's for most of us on Tuesday. Cloudcroft's high temperature on Tuesday is only forecast to be 12. If skies should clear by Tuesday night, our overnight low temperatures are going to take a dive, especially if we get a decent snow cover on the ground...and this is looking more and more likely. 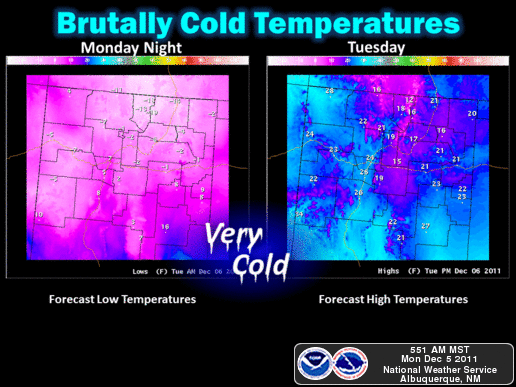 Current forecasts are projecting low temperatures across SE NM in the 10F to 15F range by Wednesday morning. Its very possible that we could see even colder readings with some of us experiencing sub-zero temperatures.